The PushPull V4 industrial connector design has been revised with imrpoved ease of use, handling and security for industrial network connections. Faced with integrated industry, the times of rigid and encapsulated production lines are drawing to an end. Decentralised industrial PCs, robot tools and other modular components are changed at much shorter intervals than before, depending on the requirements and utilisation of the production facility. From the user’s perspective, the replacement of tools and devices needs to work quickly, safely and easily. 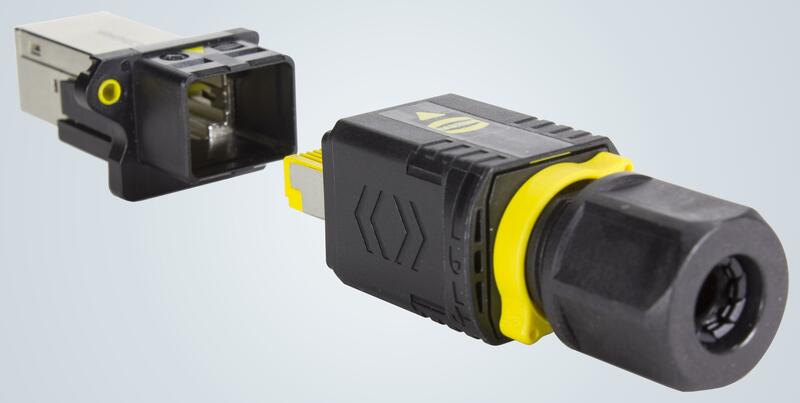 To cater for these more demanding requirements where connection technology is concerned, HARTING is releasing a new generation of its modular PushPull V4 Industrial plug connector. This latest version offers a new housing material that will withstand even aggressive chemicals, a snap-in locking device and more flexible cable accommodation. The operation has been improved with visual and haptic aids for even greater process reliability. PushPull V4 Industrial – the multi-talent for power, signals and data in a modular system. Which properties could be of particular importance for a plug connector in the context of modularisation and Industry 4.0? According to users, easy and fast handling will be as much in the foreground as robustness and the resulting broad range of applications. In an ideal case, safe connections would not require any assembly tools that could get lost, the interface would be easy to locate and also do its job without incidents after several thousand mating cycles. Unscheduled downtimes are and remain the worst-case scenario for production processes, to be avoided whatever it takes. Machines and systems in industrial production processes are becoming ever more modular and flexible, which the wiring and connection technology also needs to take into account. Plant sections need to be quickly yet reversibly connected in the set-up. If a production process is relocated or converted, HARTING’s PushPull system will even permit its lifelines to be severed and reconnected in seconds. To optimise this process even further, HARTING has subjected the PushPull V4 to a facelift, presenting it now in a second generation with new strengths. This further development of the original PushPull plug is focused on the user’s requirements. The plug was designed to become more robust while being easier and faster to operate at the same time. This is why the PushPull V4 Industrial has a new housing material that will now also protect it from extremely aggressive chemicals such as cutting oils in turning and milling centres, for example. These and other aggressive operating materials present the plugs used in an application with heightened challenges. In an environment of alkaline or acid operating materials, all parts of a system, including its lifelines, need to work with absolute dependability and process reliability. Optimised for these potential applications, the PushPull is now able to deal with even the toughest requirements, enabling an even more universal use in industrial applications. To make the manual (dis-) assembly without tools even easier, the new housing now has markedly more pronounced contours in the gripping sections that make pulling the plug easier. This innovation is of particular benefit for users wherever housings tend to get oily or wet. Process-reliability is not only guaranteed by robustness, however, but also by a simple and intuitive operation that excludes possible errors. True to the motto: “The simplest solutions are usually the best”, the second generation of the PushPull now only has one firmly attached cable clamp for sealing and cable relief, instead of the three loose ones previously included. The product is simpler while simultaneously permitting greater leeway for the cable diameter, which can now range from 4.5 to 10 mm. Depending on the application and corresponding cable, users previously needed to consult the assembly instructions to find out which of the former three seals would fit. This decision is no longer required now, making the leakiness and insufficient cable relief associated with wrong cable-seal combinations a thing of the past. It also makes the fast assembly of cables and plugs easier and safer in the field. To accelerate the speed of the plug & play principle, the second PushPull generation has been provided with two colour-coded marks. The first one serves to quickly see if the plug and socket have the right mutual orientation in their coding and can be mated without problems. That saves time and nerves in cabling projects – especially where many interfaces need to be connected. The square mating face previously made it difficult to see immediately in which of the four possible positions the plug and socket needed to be oriented in relation to one another. The clearly visible marking in the form of a yellow triangle now remedies this and saves unnecessary try-outs. The second colour coding can be freely allocated by the user and serves the correct attribution of plugs and sockets. If an application features many PushPull plugs that are installed in a row, fitters will now find it easier to keep an overview of which plug belongs to which socket. A simple but effective measure for excluding cabling errors and saving more time in the installation. And with PushPull able to transfer data, signals and power as a universal system, colour coding whatever is transferred makes absolute sense. This way, the data, signal and power lines can be quickly identified and correctly connected. Plug connectors can be fastened, locked and protected from inadvertent disconnection in all sorts of ways. Virtually every option is covered, from screwing in the entire plug as with an M12 through to securing with additional screws at the familiar D-Sub, or with clips that lock into the socket. These fastenings call for tools in their installation and disassembly, however, while not being watertight or, looking at the RJ45, not robust enough. In addition to which the assembly of many plugs in a constricted space can turn into a time-consuming puzzle. The PushPull system offers markedly greater convenience here, apart from time savings that are not to be underestimated. A clearly audible and tangible feedback meanwhile informs the user of the plug’s correct mating. One CLICK and the connection is protected from dirt and water, as well as vibrations, in keeping with IP65/67. To make the locking of the plug even more secure, the new variant now has an additional spin-lock that arrests the PushPull locking element in a mated condition, thus protecting it from inadvertent disconnection. Plug in the PushPull – click – turn the ring clockwise one eighth of the circumference, and finished. The rotating ring can also be additionally secured with a seal for extra protection from unauthorised disconnection. A marked plus in security and the possibility of distinguishing between permanent and frequently severed connections and of avoiding their inadvertent disconnection. The size and shape of the design have not been changed by the facelift, and previous applications for all power, signal or data lifelines can still be operated and deployed in the new housing thanks to the standard conformity. HARTING is also paying close attention to the users here and consistently retaining the modular system design for them. A mixed use of the older and new PushPull systems is furthermore enabled by the uniform standard. The variety of insert connectors continues to offer users the right interface for every application just as before. The power variants cover a range from 3-pin to 4-pin up to 250V at 16A, and also offer sufficient output for energy-hungry applications. Where it comes to signals, the PushPull shines in three versions. With 10 and 20 pins as well as a hybrid power/signal variant, they are predestined for use in industrial BUS systems. The range is completed by the third lifeline of data. Here, the modular housing is alternatively available with a USB mating face, the mentioned RJ45, or also with fibre optic contacts. The latter allow for up-to-date transfer rates of up to 10GBit/s, and are mostly used in applications calling for great transfer distances. PushPull V4 Industrial increases the process reliability in industrial device cabling, while saving time and nerves in the assembly. Simplified and safe handling of all lifelines, also for demanding application environments.